The BritishNational Archives release 25 files regarding UFO sightings, including a jobdescription for the post of UFO desk officer, known to be the "weirdestjob in Whitehall." Britain on July 12 released an archive of "X-Files" detailing government UFO briefings and probes into unexplained sightings, including one above Chelseafootball club. The 25 files released by The National Archives include "a lengthy briefing on UFO policy to then prime minister Tony Blair's office" along with a job description for the post of UFO desk officer, described as the "weirdest job inWhitehall." Accordingto an employee of the UFO desk, which closed in 2009, the perception that it consisted of "top secret teams of specialist scientists scurrying around the country in a real life version of the X-Files" was "total fiction." Instead,daily duties included providing briefings on the Ministry of Defence's (MoD) position on UFOs, undertaking UFO investigations, handling Freedom of Information requests (FOIs) and managing UFOlogists (UFO "experts"). Among the stranger investigations included one into a UFO sighting by a policeo fficer at Chelsea football club and another into a visit by three "men in black" to a person who reported a UFO encounter in Lincolnshire, east England. Accordingto the files, a hotel owner in Walesonce complained to her MP after a UFO landed in a field "from which two tall silver-suited 'faceless humanoids' emerged and began "making measurements'." 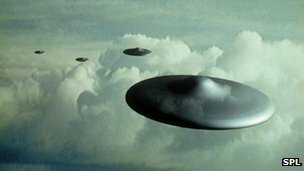 Also included in the files are details of a 1995 briefing by one of the MoD's UFO intelligence officers which speculated on why aliens would visit earth. Despite having no hard evidence for alien craft, the officer explained that any visit would most likely be motivated by military reconnaissance, scientific development or tourism. In a briefing prepared for the MoD in 1979, a UFO intelligence officer noted that no radio tracking systems had ever picked up any alien transmissions. The release of the documents came after an FOI request by David Clarke, author of the book 'The UFO files' and a lecturer at Sheffield Hallam University. "These records allow us to look behind the scenes of what must have been one of the strangest jobs in Whitehall" (shorthand for Britain's civil service), saidClarke. "We now have a fascinating insight into some of the extraordinary reports and briefings which passed over the UFO Desk on a daily basis and how its officers used logic and science in their attempts to explain 'the unexplained'," he added. Although it is said that they are 25 documents released, nevertheless ony 23 could be download to read. There is impossible to see: DEFE 24/1987/1 and DEFE 24/2078/1 where it is said: "The page cannot be found".